The Movie Art of Syd Mead, Visual Futurist (Titan Books, 2017) | 'TAIN'T THE MEAT… IT'S THE HUMANITY! 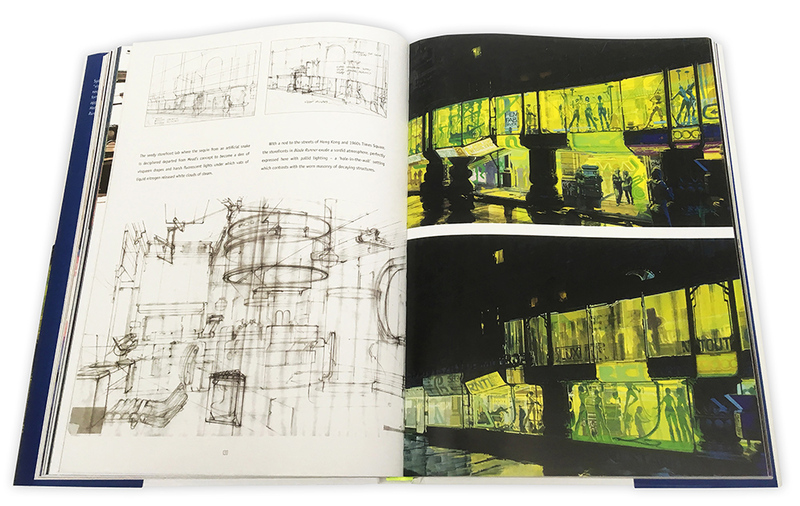 The Movie Art of Syd Mead, Visual Futurist is a new hardback art book celebrating the career of one of the film industry’s most distinctive and influential concept artists. Syd Mead’s Hollywood career began in the mid-1970’s when he received a call from venerate film director Robert Wise to work on the new film he was helming. Mead had already established himself as a respected industrial designer, with an impressive portfolio of clients that included Phlips Electronics, when he answered Wise’s request to provide concept designs for Star Trek: The Motion Picture. Mead’s imaginative and richly detailed designs for the alien V’Ger cloud were well received, and when realised by special effects maestro John Dykstra they became one of the highlights of Wise’s 1979 film. 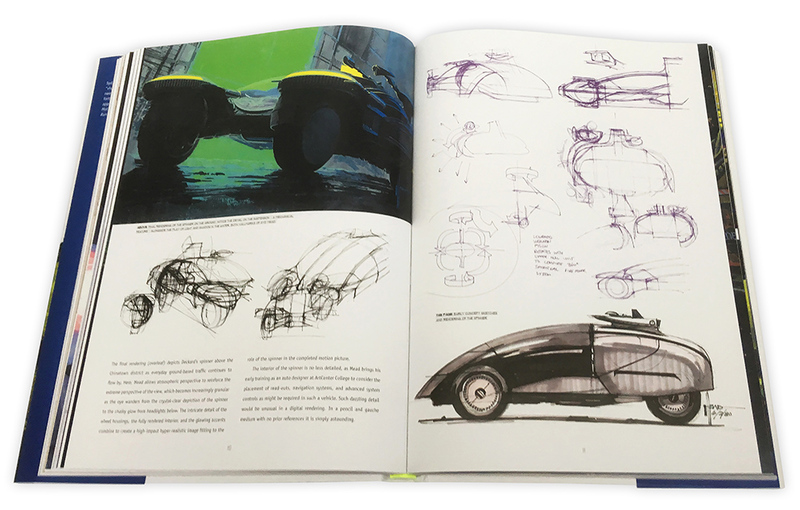 The Movie Art of Syd Mead, Visual Futurist, pages 20 and 21. Mead’s imaginative designs for Star Trek: The Motion Picture would kick-start a 40-year career providing concept art for some of cinema’s most iconic science fiction films. 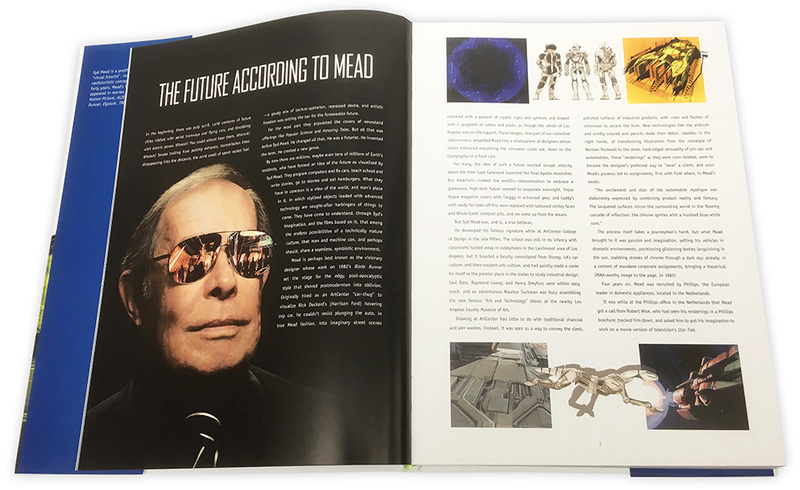 Even the most casual film fan will be aware of Mead’s contribution to cinema (even if they don’t actually know his name) — Tron (1982), 2010 (1984), Aliens (1986), Short Circuit (1986), Strange Days (1995) and Mission Impossible III (2006) all bear Mead’s distinctive vision. But it’s his ground-breaking work on Ridley Scott’s future noir masterpiece Blade Runner (1982) for which Mead will be most associated and remembered. Vehicle designs for Blade Runner, pages 110 and 111. Scott’s dystopian vision of a near future filled with flying cars, acid rain, pervasive neon and retro-fitted buildings owes a huge debt to Mead’s futurist design aesthetic. Scott, a talented artist in his own right formed a close creative bond with Mead and together the two created a new worldview, one that felt both believably futuristic yet intriguingly vintage at the same time. (So enamoured was Scott of Mead’s work that the concept artist’s $1,500-per-day price tag was responsible in no small part for Blade Runner running over budget). Unused set designs for Taffey Lewis’ club (pages 138 and 139). Since its release Mead’s groundbreaking work on Blade Runner — which included designing sets, the distinctive flying cars (‘spinners’), phone booths, and even the traffic lights — have become icons of cinema and have been imitated repeatedly. In fact it’s no exaggeration to say that Mead’s and Scott’s work on that single film probably influenced more elements of popular culture than any other in recent history. Introduction, pages 8 and 9. 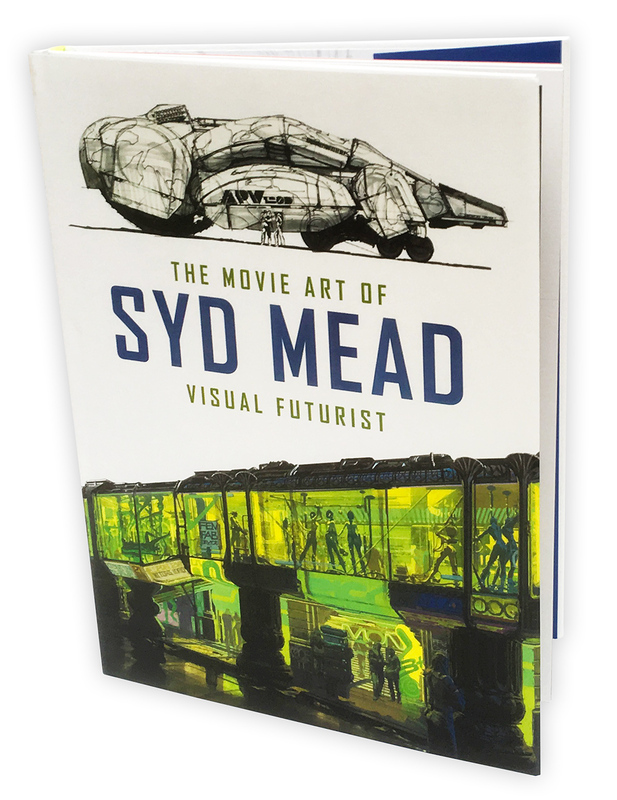 Released by Titan Books in September 2017 The Movie Art of Syd Mead, Visual Futurist is a lavishly illustrated 258-page full-colour hardback book written by Craig Hodgetts, in collaboration with Mead. The book includes hundreds of full colour illustrations by Mead as well as dozens of black and white preliminary sketches, many with the artist’s original annotations. 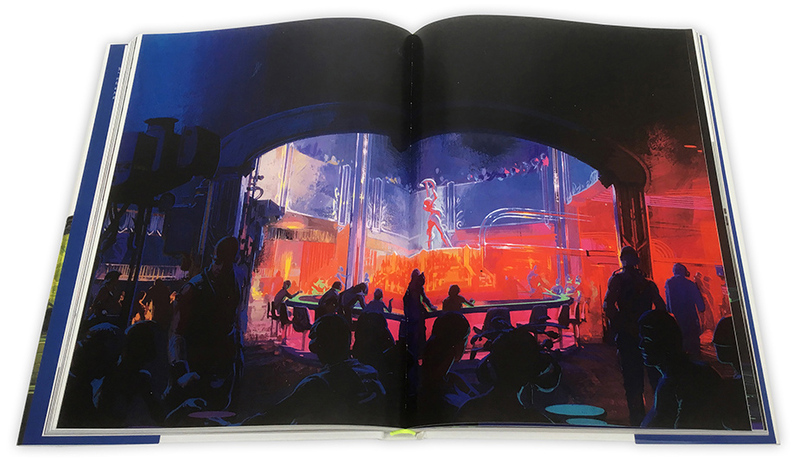 The book does a particularly fine job of highlighting Mead’s greatest strength as a concept artist: his designs look real. His work is so richly detailed and authentic that sometimes it feels as if he’s not so much creating from his imagination but chronicling that which already exists in the real world. Designs from the unproduced Topeka, pages 48 and 49. Hodgett’s running commentary throughout the book, as well as his expansive captions, illuminate the close working relationship Mead has with many of the directors he has worked with. Due to the complicated nature of film financing several of the films chronicled in the book – The Jetsons, Schizoid, Sandblast and Ektopia, for example – didn’t make it past the planning stage, but their inclusion here still provides a fascinating glimpse into the amount of work Mead puts into each project he undertakes. The book also includes an introduction by Denis Villeneuve, the director of Blade Runner 2049, who describes his experience of working with Mead on the sequel to Scott’s original classic. 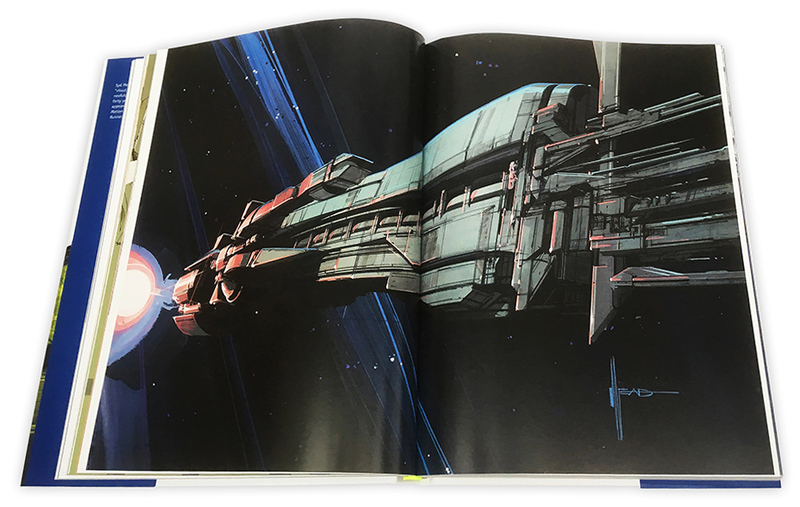 Mead’s stunning concept illustration of the USS Sulaco from Aliens, pages 62 and 63. 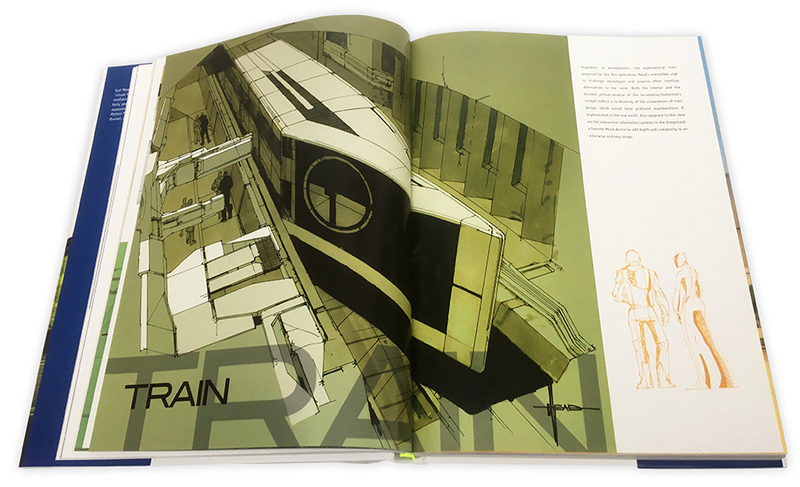 As illuminating as The Movie Art of Syd Mead, Visual Futurist is it’s not without its flaws. At times Hodgett’s commentary comes over as heavy-handed and somewhat pretentious, although on the whole I can forgive him that as he’s clearly a passionate fan of Mead’s work. However, more unforgivable is the omission of stills from the films Mead has worked on. Without seeing images from those films the reader is robbed of the opportunity of seeing Mead’s artwork manifested in the real world. All of Mead’s film designs are created to be built, be they movie sets, working models or miniatures, and he clearly creates with that important constraint in mind. By not showing the final, fully realised result of his endeavors the reader is robbed of seeing how successful those designs truly are, and that’s both a disservice to the reader and to Mead himself. Unsurprisingly the chapter on Blade Runner is the longest (pages 130 and 131). 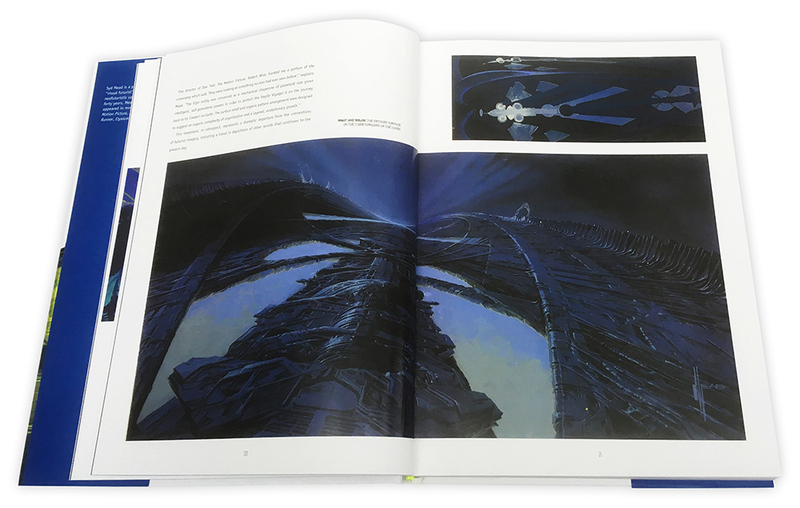 The Movie Art of Syd Mead, Visual Futurist retails for £35 ($50), but look around and you’ll find it cheaper — I found a copy for a little over £20. 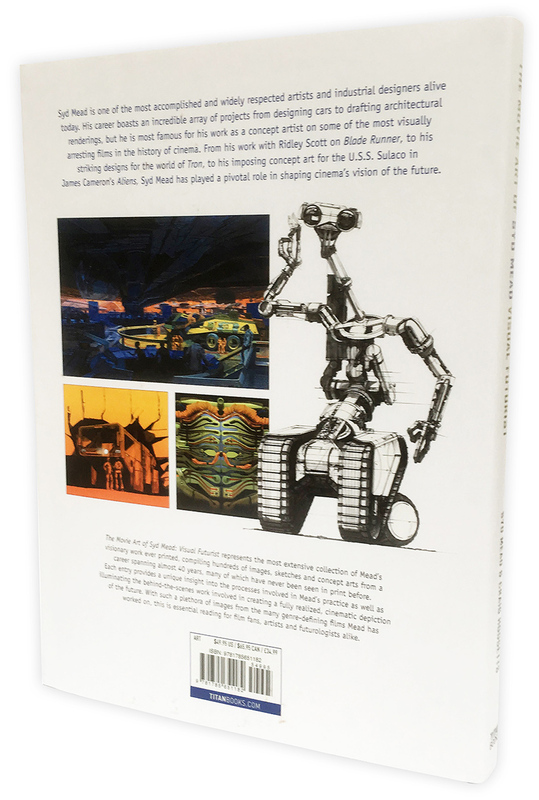 Although this is the first book dedicated to Mead’s film work, it isn’t the first to bear his name; three other books have been published featuring Mead’s futurist illustrations: Sentinal (1978); Sentury (2001) and Sentury II (2010). Sentury II is still in print but the other two are changing hands for a small fortune, so for those who don’t have cash to spare this book of Mead’s movie work should tide them over. The Movie Art of Syd Mead, Visual Futurist is a satisfying overview of one of cinema’s most engaging — and influential —concept artists. Mead’s work has graced some of cinemas most iconic films and his impact on the medium cannot be understated. A large part of his appeal is undeniably the authenticity — the verisimilitude — of his designs, and the suggestion what he is really showing us isn’t just a work of fiction but a tantalising vision of things to come. And if that is the case, then this is a rare book indeed.